Our handmade figaro link bracelets are very high in quality and finish, compared to your standard machine made link chain bracelets. 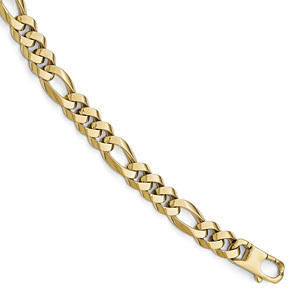 That's what makes this 12mm wide 14k solid yellow gold handmade figaro link bracelet, from Apples of Gold Jewelry, so unique. Our customers purchase our handmade bracelets, because they are often a once-in-a-lifetime purchase and heirloom quality jewelry pieces that can be passed on through many generations with proper care. Our handmade figaro bracelet measures 12mm wide and 3.5mm thick and weighs approx. 53.0 grams of 14k solid gold! Available in standard 8.5" length or any length by request (we recommend 8 1/2" for average wrist sizes due to size of the links). Weight varies and increases for longer lengths. Includes a secure, industry-standard lobster claw clasp closure. Also available in 10k, 18k, or 22k gold or white or rose gold, by request. This bracelet is made to order in the U.S.A.! Please allow approx. 3 - 3.5 weeks before shipping, as an individual craftsman spends time ensuring the utmost quality on each gold bracelet. We guarantee our 12mm Handmade Figaro Link Bracelet in 14K Yellow Gold to be high quality, authentic jewelry, as described above.